This example shows how to perform a multiobjective optimization using multiobjective genetic algorithm function gamultiobj in Global Optimization Toolbox. gamultiobj can be used to solve multiobjective optimization problem in several variables. Here we want to minimize two objectives, each having one decision variable. 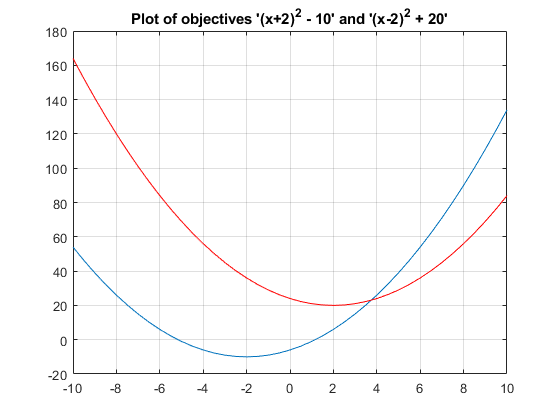 The two objectives have their minima at x = -2 and x = +2 respectively. However, in a multiobjective problem, x = -2, x = 2, and any solution in the range -2 <= x <= 2 is equally optimal. There is no single solution to this multiobjective problem. The goal of the multiobjective genetic algorithm is to find a set of solutions in that range (ideally with a good spread). The set of solutions is also known as a Pareto front. All solutions on the Pareto front are optimal. The Genetic Algorithm solver assumes the fitness function will take one input x, where x is a row vector with as many elements as the number of variables in the problem. The fitness function computes the value of each objective function and returns these values in a single vector output y. To use the gamultiobj function, we need to provide at least two input arguments, a fitness function, and the number of variables in the problem. The first two output arguments returned by gamultiobj are X, the points on Pareto front, and FVAL, the objective function values at the values X. A third output argument, exitFlag, tells you the reason why gamultiobj stopped. A fourth argument, OUTPUT, contains information about the performance of the solver. gamultiobj can also return a fifth argument, POPULATION, that contains the population when gamultiobj terminated and a sixth argument, SCORE, that contains the function values of all objectives for POPULATION when gamultiobj terminated. Optimization terminated: maximum number of generations exceeded. The X returned by the solver is a matrix in which each row is the point on the Pareto front for the objective functions. The FVAL is a matrix in which each row contains the value of the objective functions evaluated at the corresponding point in X.
gamultiobj can handle optimization problems with linear inequality, equality, and simple bound constraints. Here we want to add bound constraints on simple multiobjective problem solved previously. gamultiobj accepts linear inequality constraints in the form A*x <= b and linear equality constraints in the form Aeq*x = beq and bound constraints in the form lb <= x <= ub. We pass A and Aeq as matrices and b, beq, lb, and ub as vectors. Since we have no linear constraints in this example, we pass  for those inputs. All solutions in X (each row) will satisfy all linear and bound constraints within the tolerance specified in options.ConstraintTolerance. However, if you use your own crossover or mutation function, ensure that the new individuals are feasible with respect to linear and simple bound constraints. gamultiobj can accept one or more plot functions through the options argument. This feature is useful for visualizing the performance of the solver at run time. Plot functions can be selected using optimoptions. Here we use optimoptions to select two plot functions. The first plot function is gaplotpareto, which plots the Pareto front (limited to any three objectives) at every generation. 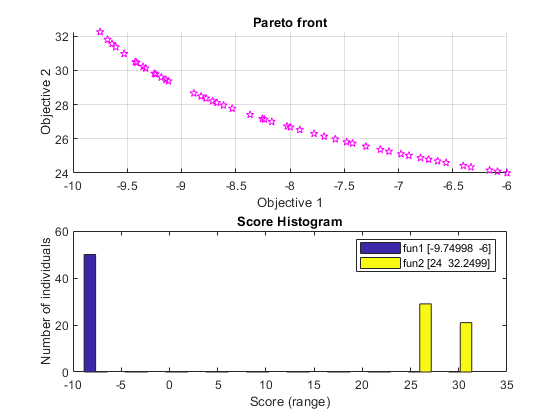 The second plot function is gaplotscorediversity, which plots the score diversity for each objective. The options are passed as the last argument to the solver. By default, the gamultiobj solver only passes in one point at a time to the fitness function. However, if the fitness function is vectorized to accept a set of points and returns a set of function values you can speed up your solution. For example, if the solver needs to evaluate five points in one call to this fitness function, then it will call the function with a matrix of size 5-by-1, i.e., 5 rows and 1 column (recall that 1 is the number of variables). This vectorized version of the fitness function takes a matrix pop with an arbitrary number of points, the rows of pop, and returns a matrix of size populationSize-by- numberOfObjectives. We need to specify that the fitness function is vectorized using the options created using optimoptions. The options are passed in as the ninth argument. Optimization terminated: average change in the spread of Pareto solutions less than options.FunctionTolerance.